Kitty Hawk Kites will continue our high flying tradition with the 5th Annual Flying High on the Harbor Kite Festival! The event features Professional Stunt Kite Flying & Demonstrations, RC Demos, Kite Making, Contests (Red Solo Cup Tower Building and Sand Castle Making), Toys & Games for all ages. At sunset, enjoy the Kites With Lights show over Noriega Point (weather permitting). 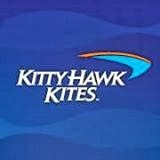 Enjoy the sites of kites of all sizes and shapes being flown on the harbor! The public is welcome to experience and learn from the pros both days.